from all over China for a job that’ll be their ticket to a better life. Outsourcing from the developed world has already lifted hundreds of millions of Asians out of extreme poverty. When you buy an iPhone you help Chinese workers enter the middle class as they become able to rent their own flat, support a family, and buy an iPhone. Apple has a code of conduct for its suppliers that requires “to provide safe and healthy working conditions, to use fair hiring practices, to treat their workers with dignity and respect, and to adhere to environmentally responsible practices in manufacturing.” The company itself conducts some inspections of supplier operations, and just yesterday, in response to reports of dire conditions at Foxconn, asked the industry-funded Fair Labor Association for an intensive audit of conditions at Foxconn. We know that Apple is doing something to take responsibility for working conditions in their supply chain. Whether they are doing enough is still open to argument. 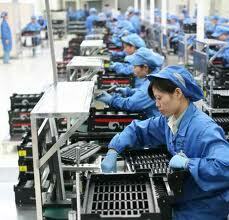 But it’s unarguable that buying my iPhone 4S will help, not hurt, Chinese workers. This entry was posted on February 14, 2012 at 2:53 pm and is filed under Business ethics, Ethics-general, International, Sweatshops. You can follow any responses to this entry through the RSS 2.0 feed. You can leave a response, or trackback from your own site. The working conditions in your picture look no different than the Dell, Geek Squad or Callaway golf assembly or repair factories. Looks like a clean, professional, process driven environment. I’m thrilled that your post highlighted the “Solution” that Apple (and many other companies) have put in place. I’m all about Progress not Perfection! Here’s to “better”. Thanks for your thoughtful comment. The photo doesn’t capture the unseen–forced overtime, toxic chemicals, et al. My sense is that Apple is trying to do the right thing, although I’m open to more info. Bob, If you haven’t already, I just wanted to give you my 2 cents. My first iPhone was a 3GS, then the 4, and now the 4S. The 4S has been giving me more problems than the other 2 models (audio cuts out, freezing, etc) It may be just my specific unit, but if you can wait until Oct for the next model, it may be worth it. Of course, the upgrade from 3GS would be significant already. Tim, Very considerate of you to offer your experience. The bad news: I received my iP4S from Apple.com yesterday. The good news–so far it’s wonderful. I especially love Siri. That vixen. She said she loved me!